I was very fortunate to be able to interview John Tuthill, a former postdoc in Rachel Wilson’s lab at Harvard Medical School. 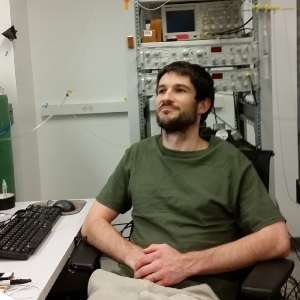 John studies the mechanosensory system in Drosophila and recently published his postdoc study in the journal Cell2. In this paper, John shows how different streams of mechanosensor information are processed and mingled in the fly central nervous system. John has moved on to start his own lab at the University of Washington. This interview took place on the evening of November 23rd 2015, a few days before he left Boston for Washington. The interview was edited for clarity and length. For the more technical part of the conversation, please check out the extended interview attached at the end. 1. Can you summarize what you have learned in this paper for our readers? Yes. We describe three different cell types that all receive input from mechanoreceptors on the leg. The interesting thing about these neurons is that they all receive direct inputs from the same mechanoreceptors, which are the mechanosensory bristles that the fly uses to detect touch. A single touch sensor (a single bristle neuron) will synapse on the three different target neurons in the central nervous system. The amazing thing about these second-order neurons is that they're all doing very distinct computations on their inputs. So a bristle sends the same signal to 3 different central neurons, which are then integrating signals from other neurons and transforming their inputs to perform completely different computations in parallel. It is somewhat unique to perform these computations in parallel. In other sensory systems, like the visual system or the auditory system, signals are typically processed hierarchically: a signal from one stage is processed, transformed, and passed on to the next stage where it is processed, transformed, transmitted, and so on. In the early stages of the somatosensory system, it seems like these computations are all occurring in parallel. This might be an adaptation for speed, which is particularly important for mechanosensation. 2. How did you start this project? When it started out, the project was relatively open-ended. At the time, little was known about the neurons in the fly that encode mechanosensory signals from the legs. I started with calcium imaging experiments in which I stimulated touch receptors on the leg and looked all over the nervous system for neurons that responded to the touch stimulus. In a sense, it was a fishing expedition. The questions were: how do the signals from mechanoreceptors on the leg converge on neurons in the central nervous system? Do different signals converge onto the same neurons? What are the types of signal transformation and integration we would see? We didn’t have any specific hypotheses – it was a relatively open-ended search. 3. 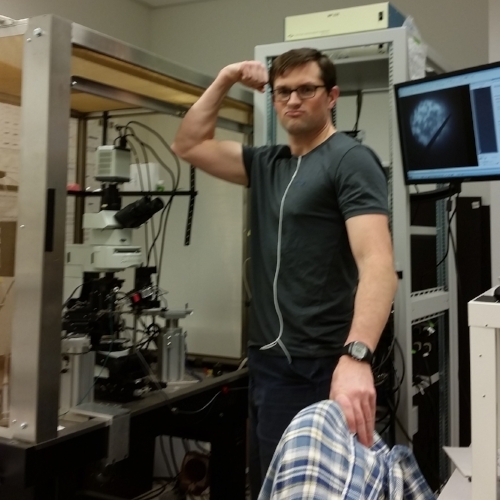 You use the fruit fly Drosophila to characterize the mechanosensory system. What are some advantages of doing that? Like many animals, flies use mechanosensation to monitor both the external environment as well as the position and movement of their own bodies. The central processing of both touch and proprioception has been challenging to study in other animals, primarily due to the inaccessibility of mechanosensory circuits for in vivo recordings, and the lack of tools to target particular types of neurons. In the fly, we can genetically label subpopulations of neurons that allow us to perform targeted recordings in intact, actively moving flies. There exist large libraries of genetic driver lines that label different neuron populations – we can visually scan through these libraries, pick out candidates that might have interesting properties, and target those for patch-clamp recordings or calcium imaging. Because these genetic tools already exist, and flies have a short generation time (just a couple weeks), it is possible to rapidly screen through different cell types for neurons with interesting physiological properties. That is why, in just a couple years, we were able to able to make so much progress on understanding the early stages of mechanosensory processing. The fly is an excellent model system for inpatient scientists like me, who are eager to do cell-type specific experiments, but are unwilling to wait around for the mouse or monkey to be ready. 4. You mentioned processing speed is very important for your system. To what extent do you think processing speed is a limiting factor in the nervous system, especially in the sensory processes? It is an important constraint because animals often need to optimize their behavior to react as quickly as possible. In the context of locomotion, animals must react to unanticipated perturbations in the environment. If an animal is hunting something or trying to avoid a hunter, it wants to be faster than its competitor. The hardware constraints of the nervous system create fundamental limits on processing speed. In order to detect salient stimuli, animals are limited by their ability to encode and transform neural signals, and also by the ability to move muscles. 5. You also mentioned spatial constraints. In your paper, you mentioned that there are a limited number of fibers that go from the fly ventral nerve cord (sometimes referred to as the spinal cord of the fly) up to the central brain, which means that it requires a great deal of local processing. Do you think that holds true for mammals? I think it’s probably a universal constraint. For animals that have a body with many spatially distributed sensors and actuators, it is beneficial to do neural processing close to those sensors and then also control the muscles close to the periphery. This may be one reason we have a spinal cord in the middle of our body and not all neural computation is performed in the brain. As a result, there exists a bottleneck of axons between the spinal cord and the brain. It is important to compress information into those axons, because they require a lot of energy to transmit signals over long distances and because they are again limited by processing speed. 6. Now that you are going to University of Washington to start your own lab and continue your research, what big questions do you think lie ahead in your field? Mechanosensation in flies is a relatively new field. This is the first study of processing in mechanosensory stimuli in the ventral nerve cord of the fly. In contrast, there has been a lot of work that's been done in larger insects, which has looked at how the how signals from mechanoreceptors in the leg are transformed in the central nervous system. There has also been a lot of research into how motor circuits control movement in, for example, grasshoppers and cockroaches. The advantage of the fly is that we will be able to use genetic tools to monitor populations of neurons that make connections between sensory inputs and motor output. My hope is that, in the fly, we can comprehensively characterize such sensory-motor control loops. For example, how does feedback from a proprioceptor on the leg fine-tune the output of motor circuits that are generating and correcting walking movements? Closing the loop between the sensory and motor circuitry is completely possible right now with the tools we have in the fly. 7. What’s your vision for how your new lab will solve those questions? Initially, our goal will be to characterize the very elemental sensory transformations that are happening from each of the four different mechanoreceptor types on the leg. In this paper, we've shown how signals from bristles are transformed in downstream circuits. We also need to understand how other signals from proprioceptors are transformed and integrated. Then, I’d like to understand these mechanoreceptors in the context of behavior – when a walking fly is engaging proprioceptors and exteroceptors on the leg, how are those signals encoded in the central nervous system and how are those signals routed to motor circuits to produce future behavior? My vision for the lab is that we will be the pushing the limits of understanding sensory coding under naturalistic behavioral conditions. 8. Do you have any advice for younger scientists? I am generally skeptical of advice from scientists. When it comes to work, I prefer to listen to people with actually difficult jobs. My dad, for example, has been paving roads for two decades; before that, he worked in a uranium mine. His advice to me has always been to avoid working with assholes. No matter what you do, whether it’s raking asphalt or writing code, it makes it easier to be working alongside people that you like and respect. My only other piece of advice is to not underestimate the importance of lunch. For me, the productivity of each day in the lab hinges on (1) whether I have a decent lunch to look forward to, and (2) whether the lunch was satisfying enough to get me through until dinner. Scientists, particularly those who are engaged in difficult experimental work, should eat lunch early and often. This is a lesson I first learned from the legendary Karel Svoboda. At Janelia, where I was a graduate student, the Svoboda lab was the first to eat lunch every day. Their lunch regimen has allowed them to consistently produce some of the most exciting and insightful work in neuroscience. 9. In your paper, you found three different types of secondary mechanosensitive neurons. Were you expecting that? Or were you just expecting it to be more or less when you first started? No, we actually found a lot more than that. We focus on three in the paper just because we couldn’t characterize and describe everything that we found. Overall, we identified about a dozen different neuron types that encoded mechanosensory signals in some way. From this list, we chose a few interesting ones that were relatively easy to record from, and characterized those in detail. But there's a lot more out there. 10. The first type of second-order neurons you describe receive information from both touch and proprioceptive inputs from the fly leg. Can you first describe to our readers what proprioception is? Proprioceptors are neurons that detect self-generated mechanical forces. For example, when the muscles in your leg contract they stimulate proprioceptive neurons associated with the muscle called muscle spindles. Proprioceptive signals are self-generated, whereas touch receptors in the skin respond to external stimuli, such contact from another person. 11. You describe neurons that perform integration both touch sensors and proprioceptors. What do you think are the advantages of doing so? It is important for animals to be able to differentiate between signals that are self-generated and signals that arise within the external world. If you feel that your knee joint is moving but you're not generating the force, it means there is some external force that is moving your knee, which is something that you want to know about. 12. The second type of neurons you describe receive signals broadly from both the distal and the proximal inputs from the leg. Can you describe what this type of comparison does for the animal? You might imagine that these neurons act in a similar manner as the center-surround receptive fields in the visual system, which consist of a central excitatory input surrounded by a larger inhibitory subfield. For a touch neuron, this spatial structure would allow the animal to distinguish between a small local touch stimulus and a broad stimulus that impacts the whole leg. 13. The third type of neurons project to both sides of the fly ventral nerve cord (sometimes referred to as the fly spinal cord). You suggest in the paper that they may compare stimuli from the two sides of the fly. What are the advantages of performing these bilateral comparisons in mechanosensation? Bilateral integration of sensory inputs is a mysterious property that you see throughout the nervous system. In the mouse or rat barrel cortex, for example, pretty much every neuron has a bilateral receptive field that integrates signals from whiskers on both sides. People have speculated that it might allow an animal to make sensory comparisons between the two sides of the animal’s face. In this case, it would allow the fly to make comparisons between the two legs. You can imagine why it would be useful during locomotion to know when one leg is on the ground or when one leg is contacting an object while another one is not. But it remains to be seen what it’s actually used for. 14. In all three cases, you have found the sensory circuit motif where a sensory neuron will simultaneous excite and inhibit (indirectly via a third neuron) the second-order neuron. Can you speculate for us what might be the advantages of a motif like this? This motif is called feedforward inhibition, and you see it throughout the nervous system. One of the things that feedforward inhibition can do is to temporally sharpen a signal. For example, if you relay an excitatory signal and then in parallel, relay the same signal through an inhibitory interneuron, you can get very temporally precise responses in downstream neurons. In the mechanosensory system, every sensory neuron on the leg provides input to each one of these second-order neuron types, and only some of them provide concomitant feedforward inhibition. This motif could be just a relatively simple way to build a center-surround receptive field that implements spatial tuning. 15. In your last figure, you found that the simultaneous feedforward excitation/inhibition balance seems to shift in a behaving animal. Do you have any guess of what this means for the animal? In different contexts, neurons need to encode different types of mechanical stimuli. In these experiments, we recorded from pairs of different neuron types in the ventral nerve cord while the animal was freely moving its legs. We saw that one neuron was often active while another one was inhibited, and that this excitation and inhibition shifted as the animal made different types of movements. Each second-order neuron is encoding a distinct feature of the mechanical stimuli that the fly is experiencing, so the relationships between neurons tend to switch based on what the fly is doing at any particular moment. Harlow, H. The nature of love. Amer. Psychol.13, 673–685 (1958). Tuthill, J. C. & Wilson, R. I. Parallel Transformation of Tactile Signals in Central Circuits of Drosophila. Cell164, 1046–1059 (2016).